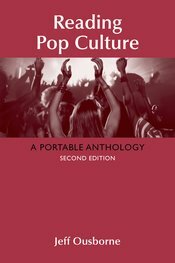 Bring students’ worlds into the classroom with Reading Pop Culture: A Portable Anthology, a compact and affordable collection that encourages students to plug in to popular culture in order to become critical thinkers and writers. This edition features an expanded introduction and greater range of reading genres—from blog posts and infographics to academic essays—prompting students to read their diverse cultural experiences as topics of inquiry: How does advertising influence our consumer habits? What are the intersections of gender, race, and language in contemporary music? What effects has "prestige television" had on Hollywood? Reading Pop Culture’s thematic chapters and paired readings raise questions like these to get students writing. New readings feature fresh perspectives from emerging writers mixed with established authors and themes for critiquing pop culture. This volume in the popular Bedford/St. Martin's series of Portable Anthologies and Guides offers a combination of high quality content and great value.